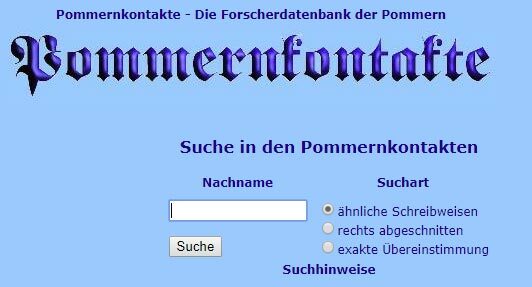 The Pommerndatenbank, the Database for Family Research (Genealogy) in Pomerania, is an online database covering all of Pomerania which was compiled for people researching their ancestors. It can be found at pommerndatenbank.de. Gunthard Stübs maintains the Pommerndatenbank and the three different databases within it. His Pomeranian ancestry makes him an “expert” on the subject of Pomeranian genealogy. Over 15,000 people have submitted names to the contact database so that researchers can connect with each other when researching their families. This database is a contact exchange – a place for Pomeranian family researchers to get in touch with each other. A researcher can submit database details within the localities in Pomerania where he has family names and then others can contact him with queries. First or given names are not necessary in this database. Time frames (from … until) can be added to an entry if desired. Because administrative changes occurred and boundaries changed in the area quite frequently, the effective date of 1 January 1939 was chosen for the county divisions used in the database. The submitter must register with Pommernkontakte with a name and email address so that contact can be made with others. Many Pomeranian cities and counties printed address books before World War II (primarily the late 1890s and the early 1900s up to the 1940s). These books often listed the full names of the household with other information such as home address, all family members’ names, professions, house or land ownership, etc. The books also give clues of origins because of the frequency of a surname found in certain areas. Unfortunately these books are usually hard to find, and since they are rare they cannot often be loaned from libraries. This Address Book Project seeks to make a searchable database of names found in address books. A researcher can click the “data” link found on the left side of the page to see what address books, listed by Kreis (county) and for what years, have been included in the database. There are presently 145 different address books included in the project. Within the last ten to twenty years the major archives holding Pomeranian church records have published lists of their holdings. Since many records were lost during or following World War II, an inventory of existing records and places holding them is very important to Pomeranian researchers. The goal of this database is to collect the data listing the existing church books and civil registers that are kept in approximately 300 location. In this database information on the church books and civil registers in existence has been submitted. The number of entries so far is only a small percentage of the number of Pomeranian holdings in total. The database is searchable by place name and the results give the Kreis of the place name, list the church books in existence and if civil registers are available. The database gives the type of church record (birth, marriage, death, and confirmation) and the years available as well as the archives that holds the record books. For Standesregistern the holder of the records is given. Linda is a member of the Pommerscher Verein Freistadt in Wisconsin and an avid genealogist. She plays a vital role with the PVF, co-managing both their website and their newsletter.